Two part room temperature cure coating system with 35% solids and pre-measured accelerator. 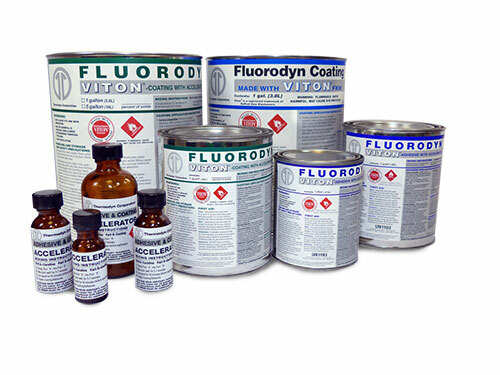 Fluorodyn™ two-part coating (made with Viton™) was developed in conjunction with DuPont engineers to perform in high temperatures, aggressive vapors, and extreme environments. The coating with accelerator offers superior chemical resistance when material must be fully cured, and heat is not an option. Coated surfaces can be back in service in as little as 17 hours after application. This two-part coating is easy to mix and ready to use in 15-20 minutes. It withstands temperature extremes from -20°F to 450°F with peak temperatures up to 500°F. 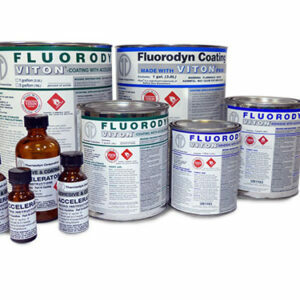 It’s resistant to over 350 fluids including concentrated acids and hydrocarbons.